Sunchokes are thin-skinned, knobby, potato-look-a-likes. The tubers are the root stem of a variety of sunflower that can grow up to ten feet tall with smallish yellow flowers. Sunchokes have “eyes” similar to potatoes, some varieties are smooth whereas others are more knobbed. The tubers have a light-beige to tan-colored skin. The crisp, ivory flesh of the Sunchoke has a texture similar to water chestnuts and a sweet, nutty flavor. Sunchokes are the bulbous, medium-sized tubers of the plant known botanically as Helianthus tuberosus, or commonly, a variety of sunflower. The plant is propagated primarily for its root which can stay in the ground indefinitely, though it loses any culinary value if left underground too long. Native to North America, Sunchokes are one of the few vegetables to travel back to the Old World with explorers and have a lasting culinary impact. 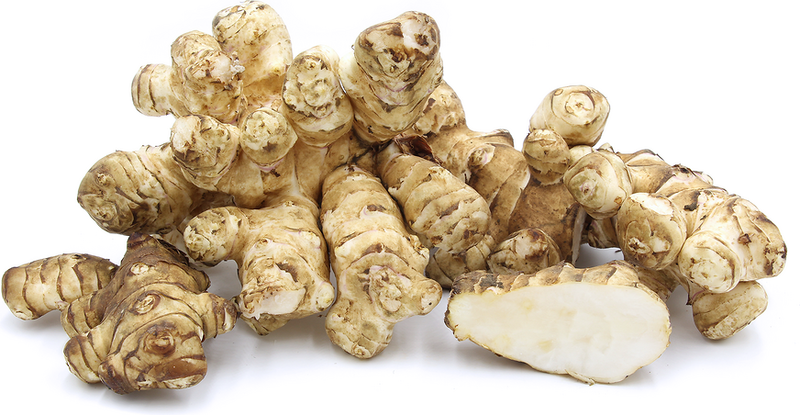 For a time, the tubers were called Jerusalem artichokes, despite being unrelated to either Jerusalem or artichokes.